Noise is often the single toughest challenge faced by design engineers when developing products especially in medical applications. The inherent noise issue with many types of motors is the brushes. Brushes create mechanical and electrical noise due to friction against the commutator, as well as arcing caused by current conducting through the brush and commutator. A reduction in noise level of 10 decibels is an impressive achievement. The decibel scale is logarithmic, not linear. Every three dB decrease of the sound level cuts the intensity of the sound by half. 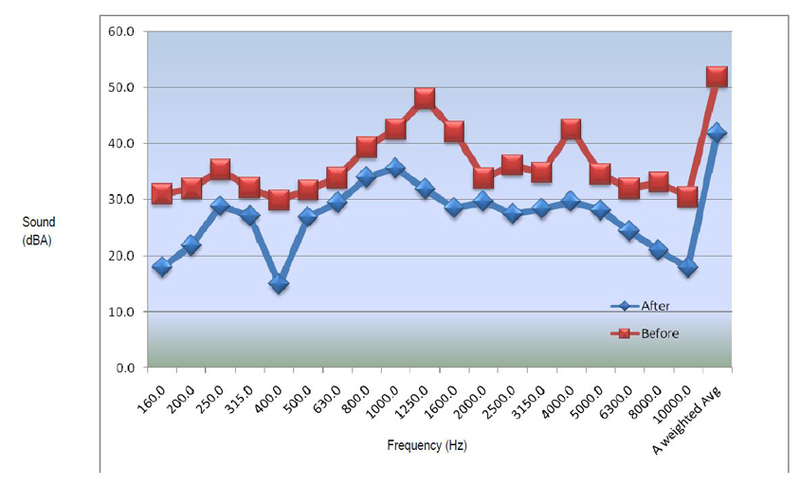 The data shown in the graph represents the 1/3 octave band testing data taken on a PMDC motor before and after the bullet pointed customizations. *Note: the higher the RPM of the motor the more sound will be radiated from the motor.